UNL's Project SENSE will be hosting five events this July and August to demonstrate how to outfit equipment and implement sensor-based, in-season nitrogen management strategies. Project SENSE (Sensors for Efficient Nitrogen Use and Stewardship of the Environment) focuses on improving the efficiency of nitrogen fertilizer use. This fertilizer management strategy uses sensors to assess crop nitrogen status during early crop growth stages. Nitrogen is then applied specifically when and where it's needed at a rate necessary to meet crop needs. This in-season responsive nitrogen application can provide improved nitrogen fertilizer efficiency and reduced groundwater nitrate levels. Figure 1. View crop nitrogen sensors and high-clearance nitrogen equipment in action at five Project SENSE Demonstration Days this July and August. 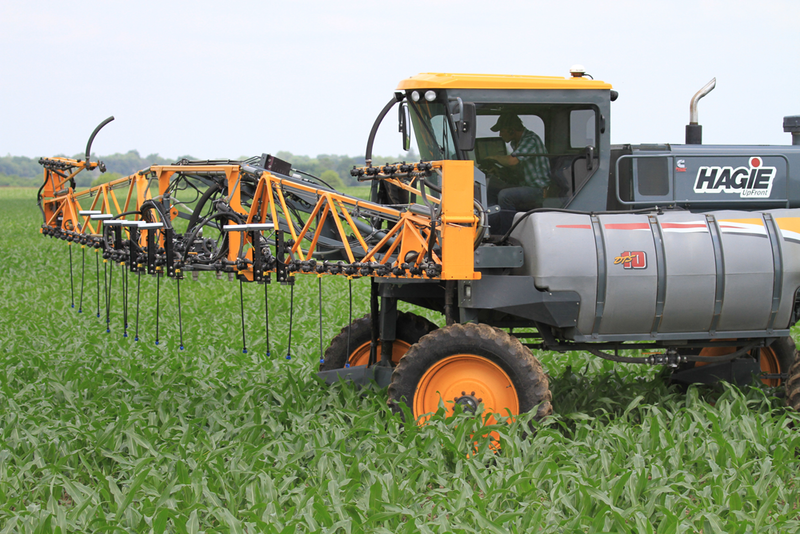 At the Project SENSE Demonstration Days growers will see a live demonstration of the project's high-clearance nitrogen applicator outfitted with active crop canopy sensors. Attendees also will learn about how producers are conducting their own research trials in partnership with the Project SENSE team to implement this nitrogen management strategy. Project SENSE is a collaborative effort of the University of Nebraska-Lincoln, the Nebraska Corn Board, five Natural Resources Districts (Central Platte, Little Blue, Lower Loup, Lower Platte North, and Upper Big Blue), and producers participating in the Nebraska On-Farm Research Network. Aug 6, Chapman – 10 a.m. Ken Seim Farm. Directions: Travel west of Chapman on G Rd. (blacktop) to 2nd Rd. (Worms Rd. ), then north to K Rd., east 1 mile to 3rd Rd., and south 1/2 mile. The demonstration site is on west side of road at GPS coordinates 41.06828244, -98.249724. The 6 p.m. programs start with a meal/supper and the 10 a.m. demo day will conclude with lunch. Please preregisterfor the demos for meal planning purposes. To preregister, call 402-624-8000 or e-mail christina.franklin@unl.edu. For more information see the Project SENSE Demonstration Days brochure. Nebraska Extension is in the University of Nebraska's Institute of Agriculture and Natural Resources.